The Winter months can wreak havoc on your hair. One minute it’s raining, the next we have icy blasts of arctic wind that chase us around the streets. 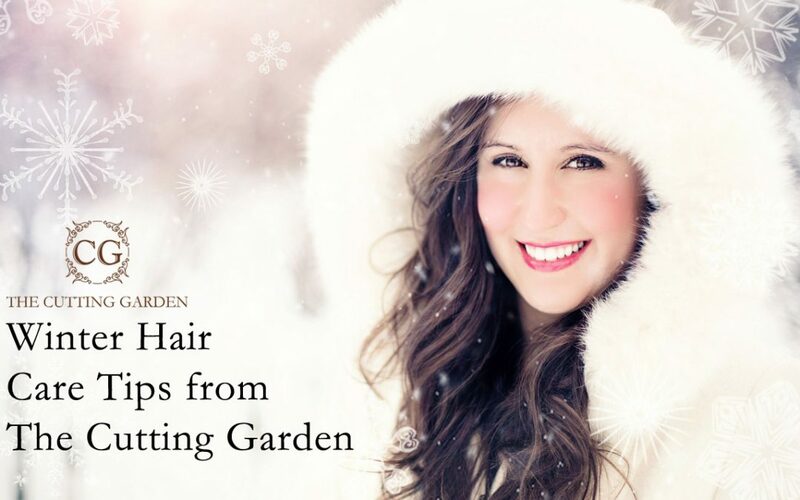 Never fear, though, The experts at The Cutting Garden in Plymouth have rallied around with 12 great tips to keep your hair looking and feeling great until the Spring. Always use a moisturising shampoo and conditioner whenever you wash your hair. Whilst it may be tempting to skip this if you are in a hurry, your hair badly needs the extra moisture and protection. Our favourite moisturising shampoo is Keune Satin oil shampoo and conditioner. You can pick one up from the salon. Treat your hair once a week to a deep conditioning treatment. This will give greater and more long-lasting conditioning and protection to your hair than your usual conditioner. As it takes a little longer, the weekend is often the best time to do this, or come into the salon and we’ll do it for you. A deep conditioner we recommend is the Keune care line intensive hair repair mask. This is a really effective treatment and we always keep some in the salon in case our clients want to buy it to take home. Here’s an expert tip. Always apply a good quality heat protection spray before blow drying or using straighteners, as heated appliances are notorious for damaging and drying out hair. The spray will coat your hair with a protective layer and help to prevent damage. 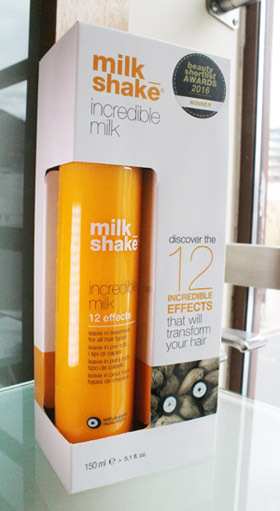 We recommend Milkshake 12 Effects Incredible Milk, available in our salon – just ask your stylist or at the desk. Have regular trims every six to eight weeks to remove split ends and prevent them from travelling further up the hair shaft. You will look and feel a lot better as split ends cause hair to look uneven and a little frizzy. I love this pro tip shared by one of our stylists. Even though it might be tempting to use hot water on a cold day, always wash your hair in lukewarm water as hot water causes it to dry out. Did you know that hair is prone to dryness in the winter? Wash your hair less frequently to avoid it drying out (say 2-3 times per week). Washing it every day can tend to remove even more moisture, and there are limits to how much even the best conditioners can replace. Do your hair a favour by allowing it to rest a day or so between washes. It’s cold out there! Wearing a hat when you go out can help you look stylish and keep your hair covered from the wind, rain and snow. To avoid the dreaded hat hair, wrap your hair in a silk scarf before putting on your hat. A hat made of natural fibres, such as wool, will also be beneficial as it allows your scalp to breathe and helps to avoid friction. 8 To Brush or Not to Brush? Don’t over brush your hair as it can be more dry and brittle in the winter and brushing can damage it. A wide-toothed comb is a gentle option. Always start at the ends of your hair, gently ease out tangles and then work your way slowly up to the roots. Massaging your scalp daily for 10 minutes will increase the blood flow and encourage healthier hair. Not only that, it will relax and de-stress you, which will give all-round health benefits. That’s why we always offer a scalp massage whenever we wash your hair. Dry your hair before you go outdoors because cold weather can damage wet hair. If you don’t have time to dry it in the morning, try getting up a little earlier, or washing your hair in the evening instead. It’s worth losing a few minutes’ sleep for beautiful hair! Wear your hair tied back or in an up-swept style to avoid frizz and static, especially when exercising. Not only can it look stylish, it will help to prevent wind damage and static forming in your hair. In the winter, having double glazing and central heating is a blessing, especially when you get in from work and all you want is a warm room and a hot chocolate. But they can make the air in modern homes very dry. which can have a detrimental effect upon your hair. We suggest using a humidifier to add a little moisture back into the air, but don’t overdo it or you’ll have the opposite problem and end up looking like you’ve just come out of a sauna. In the winter season, cold weather and blustery winds can have a very bad effect upon our hair. Not only this, central heating can cause our hair and scalp to dry out. In the winter many people find that their hair is more dry, limp, dull and frizzy than in the summer. We all want to look our best whatever the season. Having great hair increases our self-confidence and feeling of well-being. If you want to avoid these common winter weather hair problems, follow our twelve top tips to care for your winter hair. This way, whatever the occasion, whether it be a meeting, at work or dancing the night away at a Christmas party, you will always feel at your absolute stunning best.